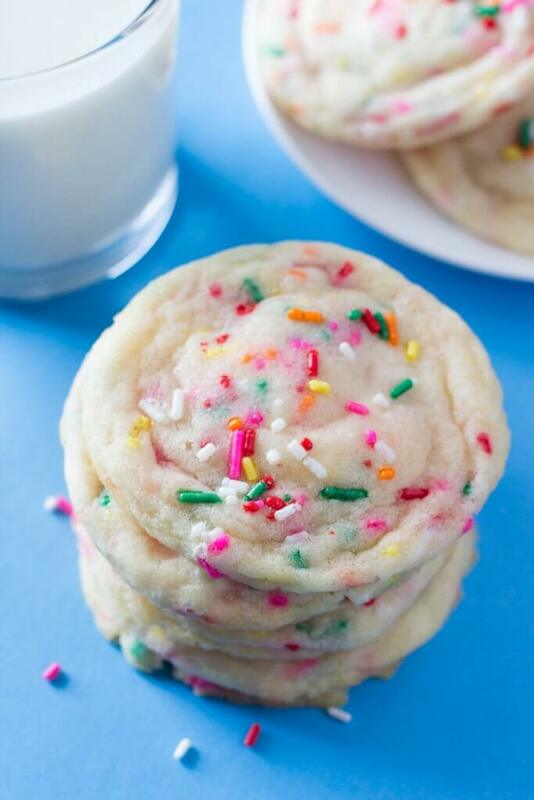 Soft, buttery Funfetti Cookies loaded with sprinkles and filled with happiness. 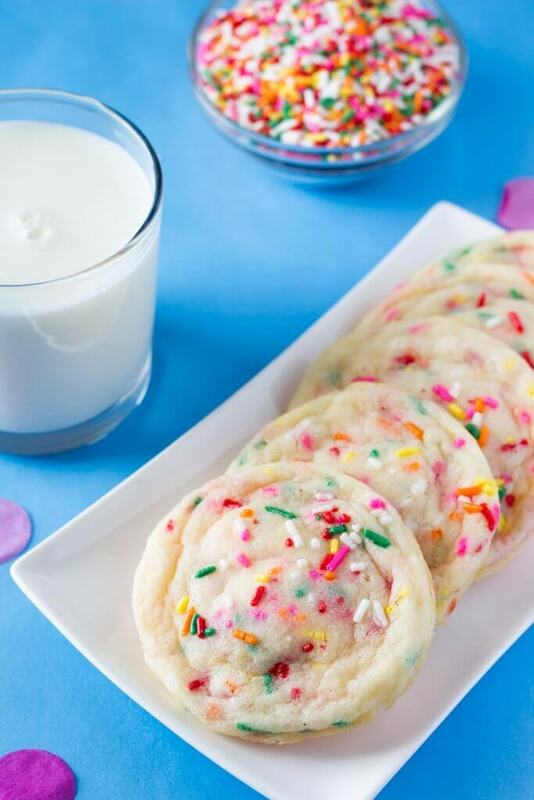 These funfetti cookies are made from scratch and way more delicious than using cake mix. 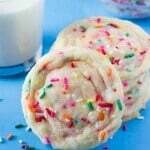 Learn all the tricks to make these sprinkle cookies. It’s been awhile since I made cookies. And even longer since anything with colorful sprinkles has graced my kitchen. So clearly its time to up the happiness factor, put on our party pants (aka apron) and make Funfetti Cookies. 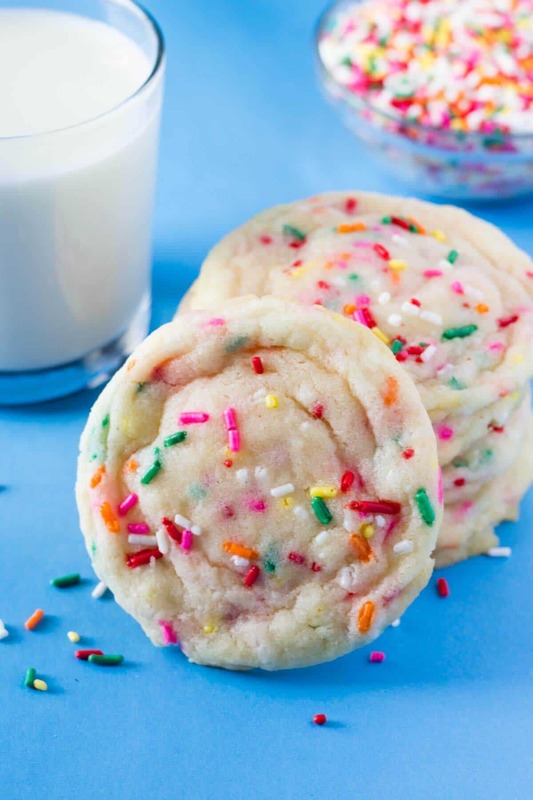 Soft, buttery sugar cookies with a slight hint of almond & filled with sprinkles. 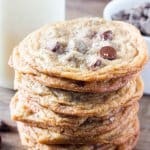 They’re the type of cookies that are perfect for birthdays and special occasions, and they make me feel 5 years old in the most fantabulous way. 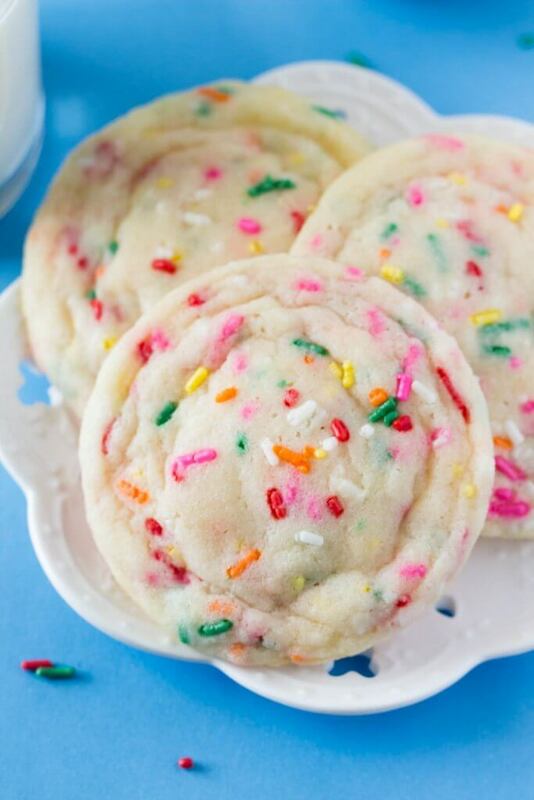 Because who can say no to a funfetti cookie? and enough sprinkles to compete with Rainbow Bright. 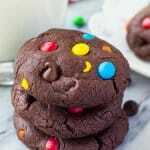 You can find the full recipe instructions at the bottom of this post ( Jump to Recipe ) – but I wanted to go into more detail about what makes these funfetti cookies so delicious. First things first – we’re using real butter for the most flavor. Then vanilla and almond extract create an almost delicate quality. Now for the flour we need just the right amount. Too much and your cookies lose their buttery flavor & super soft consistency. Not enough and your cookies get flat and crispy. Then for super soft cookies with a delicate texture we’re adding cornstarch. And as a “secret” ingredient – we’re adding cream of tartar to the batter for the perfect consistency. It helps create cookies with that melt-in-your-mouth texture. Like most of my cookie recipes, we’re forming the dough into balls and chilling for at least 3 hours prior to baking. Because the cookie dough is very soft, chilling is 100% mandatory or else your cookies will spread way too much and easily burn. I also like to slightly under bake cookies for the chewiest consistency. The tops should be just set when you remove them from the oven. They’ll continue baking as they cool on your cookie sheet so there’s no need to worry. 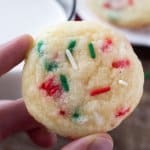 The funfetti cookie dough comes together in about 10 minutes – so it’s super easy AND tastes so much better than using a mix. In a large bowl whisk together the flour, cornstarch, cream of tartar, baking powder, baking soda & salt. Set aside. In a large bowl beat together the butter and sugar until light and fluffy. Add in the vanilla, almond extract and egg and continue beating until well combined. Turn the mixer down to low. Carefully beat in the flour mixture about 1/2 at a time. Stir in the sprinkles using a rubber spatula or the mixer on low speed. Form the dough into balls approximately 1.5 tablespoons in size and optionally place a few sprinkles on the top of each ball. Do not flatten. 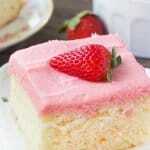 Set on a plate, cover with plastic wrap, and refrigerate for at least 3 hours or up to 48 hours. Chilling is absolutely necessary. When ready to bake, preheat the oven to 350F degrees. Line cookie sheets with parchment paper or a silicone baking mat and place cookies on the sheet about 2 inches apart. Bake for 8-10 minutes until the tops of the cookies look just set. Allow to cool for at least 10 minutes on the baking sheet before transferring to a wire rack to continue cooling. These are delicious and remind me of my childhood! So soft and just the right amount of sugar so they’re not too sweet. I don’t think I know of anyone who can resist a good funfetti dessert. 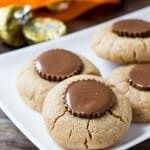 These look SO yummy, and perfect for all occasions! Thanks Karly! I’m definitely of the mindset that the more sprinkles the better! I’m so glad everyone loved the cookies! Thank you for the referrals! Made these for my niece’s birthday and they were a huge hit! THANK YOU!!!! Can I chill the dough prior to rolling? I just wanted to chime back in and say that these turned out great, even without refrigeration! Couldn’t imagine them any better!! Thanks for the wonderful recipe. Husband even said they may be one of his new favorites!! I’m sorry they didn’t flatten out more for you 🙁 I’d do a taste test and go from there! My guess is that a little too much flour was added. You could try removing a tablespoon next time, or flattening them slightly after forming them into balls. Can we substitute cream of tartar with anything else??? I didn’t have any cream of tartar when I made these, so I substituted with 2 tsp white vinegar, and let me tell you, they were amazing, soft and chewy with the perfect consistency. Loved this recipe, now I’m looking for a cookie recipe using white chocolate chips and walnuts. Any ideas? I thought about using this recipe and just replacing the sprinkles with the white chocolate chips and walnuts. It was that good! Can you freeze the dough to cook at a later date? I am trying to pre-make things for an event we are hosting in March. Definitely! I’d form the dough into balls, then place them in a ziploc bag to freeze. When ready to bake, you can bake the cookies from frozen. They’ll probably take about 1 minute extra.